Below read the research results prompted by a 2010 Springtime snow and wind storm that felled the impressively huge Donner Cross. For your own fact checking on this and other historical artifacts contact our research library staff at history@truckeehistory.org. Many people drive by a large white cross every day without even noticing it. Other people see it, but don't know why it's there. Located off Donner Pass Road between Truckee Elementary and the Citizens Bank Plaza, the 16-foot cross is a site to see. Truckee citizens erected the first cross in 1887 to mark the site of the Graves-Reed Cabin at Donner Lake, where members of the Donner Party were trapped during the infamous winter of 1846-47. According to the Truckee Republican, "The Cross is 24' high and is painted white. It can be seen from the road to Donner Lake." There were plans to erect three more crosses as soon as funds could be raised. By 1906 the Donner Cross was rotting through. Owning the land where the cross rested, the Donner Ice Company replaced it with a new 20-foot cross. In the 1920s, Captain Charles E. Davis set out looking for lost emigrant trails. One of the trails Captain Davis followed was the same one blazed by the Donner Party. This expedition led him to the Donner Cross in 1927. At this time, the cross was burned away at the base from a campfire. Davis condemned the desecration of the landmark and vowed to restore the cross. Work to construct a stretch of Interstate 80 through Truckee began in 1958. 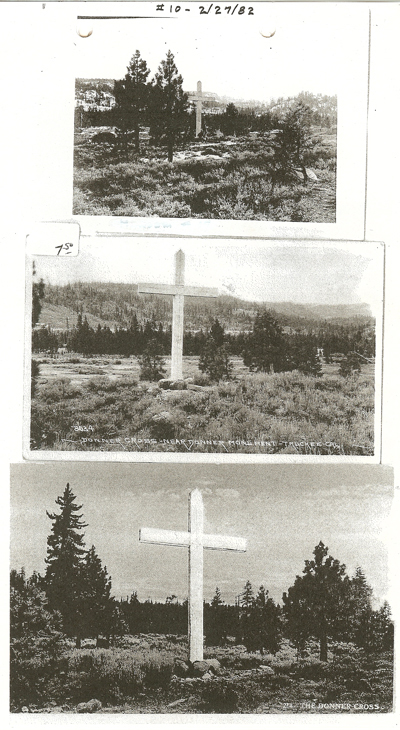 During the early construction of the highway, the Donner Cross was moved to make room for the road. The original Agriculture Station was built on the site where the cross had been located since 1887. For many years, motorists passed the cross as they drove through on I-80. This would not be the final resting spot for the Donner Cross. In 1988 the cross was moved again, this time to make room for the Factory Outlet Stores, now referred to as Citizens Bank Plaza. 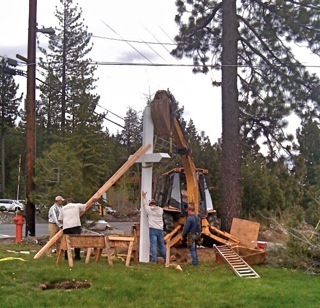 At that time, the Donner Cross and a bronze plaque were moved to a piece of land between Truckee Elementary and the stores and an easement was granted to the Truckee Donner Historical Society. This spring the Donner Cross fell victim to years of Sierra weather, rotting through and falling down. Mark Tanner stepped forward to help the Truckee Donner Historical Society replace the cross, ensuring that residents and visitors continue to remember the story of the Donner Party. Mark Tanner Construction sent out a crew, led by Jim Smith, to construct and erect a new cross. Kevin Casey of Caseywood Lumber donated half of the materials, Mike Rodarte of TNT Materials donated the concrete and Stephen Birch of Accurate Painting and Staining painted the cross. Bill Whitehead, The Richardson House and Marissa Campbell donated money to cover the rest of the costs. Everyone was very generous with their time and their wallets to make this project happen! We would also like to thank Tom Macaulay for providing historic newspaper articles and photos of the original Donner Cross. If you would like to view these photos [in person], visit the Joseph Research Library, open Thursdays from 10 a.m. to 2 p.m in the Old Gateway Motel Cabin located in Meadow Park. The Truckee Donner Historical Society would like to thank everyone who helped us carry on the tradition of the Donner Cross! Joseph Research Library is open to the public 10115 Donner Trail Road, Truckee, CA.